The holidays are fully upon us, and the older I get, the more curmudgeonly I seem to become. At times I really can be like that mean old Mr. Grinch, completely perplexed by those bright lights and annoying sounds of holiday cheer. Don’t get me wrong, I love holiday lights as much as the next person, within reason, as they do add so much warmth into what is currently a very cold world. But Christmas music, especially when it begins in November, bah humbug! This attitude is in stark contrast to my childhood holiday experience. When my sister and I were growing up my parents would go out of their way to make sure every Christmas was full of magic. My mom is Italian and an amazing cook and baker. She would make dozens of different types of cookies, filling our home with the delectable smell of the holiday. She would make all of those dozens so that she could share them with neighbors, family, and friends, bringing holiday cheer to them as well. As an aside, her chocolate chip cookies are still the best I’ve ever had, hands down…I guess love really is that special secret ingredient! Looking back, every Christmas was the same, we would go to my grandmom’s for an Italian Christmas eve feast with the entire extended family, then drive home “before Santa”, all the way looking up toward the night sky for old Saint Nick and his sleigh full of reindeer. 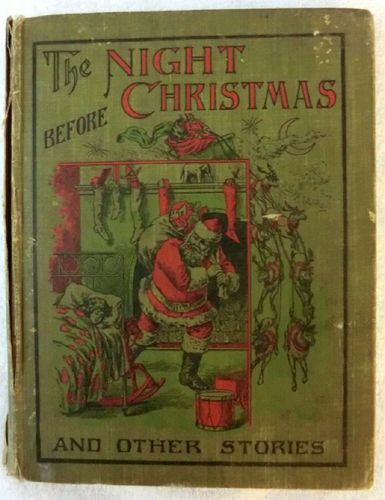 When we got home, my dad would read ’Twas the Night Before Christmas' and then my sister and I would fight going to bed, too full of excitement and anticipation to sleep. Early that next morning, my sister and I would wait desperately for our parents to wake so that we could rush down stairs to see what Santa brought us. My parents however wanted to make everything as special as possible so they would go downstairs first, my dad would put Bing Crosby’s White Christmas on the record player and make us hot tea, while my mom lit the tree and made sure the piles of presents were just right. Though I am very anti-materialism now, looking back, those are memories I cherish. When my kid was born I tried to get back into the holiday spirit — the nostalgia of all of the amazing memories from my childhood, I wanted that for her. So I started reading her Twas the Night Before Christmas on Christmas Eve, from the same book my dad read from to me; I got a tree and decorated it with festive lights; I would go downstairs Christmas morning and put on Bing Crosby’s White Christmas (sadly on CD, not vinyl), make hot tea, and watch as my own kid opened up her presents, hoping for her to also be transported into a magical holiday wonderland. As the years went on though I slowly started to be less interested in spending hours decorating the house, fighting with string lights that never seemed to work, trudging a Christmas tree through the house, fighting to get it in the stand, and shopping for gifts just to put under that tree. Because here’s the thing, my wife and I are raising our kid with different values — we didn’t want to focus Christmas on the number of presents under the tree. So today, to combat the materialism of the Christmas season, and in the spirit of the age old Christian adage “it is better to give than receive”…instead of giving gifts, our family makes donations to non-profit organizations. To us, that means so much more of what the true spirit of Christmas is about than buying crap no one wants or will remember! In addition, the gifts we do buy we try to buy local, from our small neighborhood shops. And we never wrap presents, as wrapping paper adds to the destruction of trees and trash in the landfill (though if you do use wrapping paper please reuse and/or recycle it). As I have come to realize over the years, the holiday season is about spending time with family and friends, giving back, and doing good. So this holiday season, if you need to purchase a gift, give the gift of art or shop local; instead of buying stuff give something homemade; or give give a gift that keeps on giving, a (year-end tax deductible) donation to a non-profit organization! For as we saw in that favorite holiday classic, the Grinch’s heart grows 3 sizes not because of all those lights, or presents under the tree…but because little Cindy Lou-Who was kind to him. Kindness. That is what the holidays are about, that is what I want to build my kid’s holiday memories on, and that is what will make all hearts grow 3 sizes. We would all do well to remember it’s power this season!